Amazing doesn’t even begin to describe Exploring Creation with Astronomy, 2nd Edition from Apologia Educational Ministries. It truly lives up to all the glowing reviews I came across on the web. If you want to learn about our first experience with Apologia curriculum read on. We would spend an hour 2-4 times a week reading the text, doing hands-on activities and sometimes listening to the audio CD. Let me tell you about our experience with each part of the curriculum in more detail. A thick hardcover book feels and looks like a quality college textbook. However, it’s written in a conversational, personal style that appeals to young children. It provides a comprehensive conceptual framework for understanding the major structures of our solar system, including the sun, the moon, the planets, and galaxies, but in a language that kids can understand. Each lesson is organized in such a way as to break the text up with full color photographs, infographics, hand-on activities, comprehension questions and What do you remember quizzes. On Science days I curled up with kids on a couch and read parts of the textbook. We often stopped to discuss what we read, googled for some specific illustrations or related youtube videos. If there was a related activity in a notebooking journal, we moved to the table to complete it. “Are you sure I can write in this,” asked my son incredulously, “it looks like an expensive book.” The notebooking journals designed by the author of the textbook in partnership with a NASA engineer is indeed beautifully designed and very colorful. I am a lifelong journal keeper and scrapbooking enthusiasts, so I have to fight an urge to use it myself! The notebooks are big, over 300 pages long and include lesson plans. There are two journals to choose from depending on your student’s age. The Junior Notebooking journal is designed for grades K-2nd/3rd (and it was perfect for my 1sr grader), and the main journal is a created for older kids (and worked for my 3rd grader). I only spied two differences between the two versions. The Junior Notebooking Journal includes coloring pages and the standard journal does not. Also the Standard Journal features a more advanced writing section called What Do You Remember. This section includes comprehension questions that require an essay style answers like Can you explain the difference between revolving and rotating? My kids favorite notebooking activities are making mini books, crosswords, and astronomy coloring pages. We skipped the copywork completely and used the notebooking pages for recording science activities observations, for drawings and notes. I think Apologia Notebooking Journals are simple and effective tools to encourage kids to record their thoughts and to practice writing and drawing. If you have fidgety children, you might want to ask them to color while you are reading the text. If you are not sure if journals are for you, you can download a 23-page Notebooking sample here and a Jr. Edition here . You will get a peek at Suggested Daily Schedule, Parents Guide and the actual notebooking pages. This is a complete audio recording of a textbook as read by the author herself! At first I thought I would read most of the textbook with my kids, and on the day I wasn’t up to it I would put in the disk. As it turned out,I found the textbook so fascinating I couldn’t stop reading it, but we found a good use for CD too. We would first read the textbook together and do the activities. And as a summary at the end of each chapter, we would listen to the audio recording (sometimes more than once) to really seal in the lesson. Do yourself a favor and get a complete science kit. I did! It includes materials for 63 activities (excluding only the food and other perishable items)!!! On the main website you can check out the kit’s detailed list of content, activity list, activities guide and sample activities. I generally love to do the leg work, but if you are in the point of your life when you simply don’t have time to gather 87 supply items and make 4 trips to 4 different stores, then the kit is definitely a way to go. As I’m getting closer to my due date I’m looking for ways to make my life easier. Under normal circumstances, there is nothing I love more than to create my own curriculum, especially when it comes to science. The only draw back of my do-it-yourself method is that it takes lots of energy and time. I’m glad to say that Apologia lived up to my very high standards. I think that the textbook, the journals and activities simply amazing. If you want to save yourself some extra time, you can buy the Science Activity Kit that contains all the materials you need for projects. I love the focus on a narrow field of science at at time. I would rather my kids had a solid grasp of few concepts than covered many diverse topics lightly. In order that the material can really be enjoyed we found that we needed to move even slower than the recommended schedule. Just to give you an example: Lesson 1 is recommended to be covered in four days and includes topics such as: The Night Sky, Stars and Planets, Clocks, Calendar and Seasons, Navigation, Gravity, Our Solar System, Astronomers and Astronauts, and Satellites. Once we got to Clocks and Calendars there was at least a full week of additional activities I had to plan for because my kids decided to learn how to tell time. I love that this curriculum motivates my kids to learn more about different topics. Apologia curriculum has a strong Christian outlook. Because we are Secular homeschoolers that was a concern at the start. I’m glad to say that it wasn’t a problem. The text doesn’t attack any other views. If you are reading the book together with kids, it’s easy to skip short religious passages. And if you listening to the disk together and kids ask questions, it presents a great opportunity to discuss your family views. The course has the depth of a college course, while it reads like a living book. The hands-on aspects are engaging. The conversational narration appeals to young children. I find this science curriculum interesting, comprehensive and worth the time, money and effort spend going through it. Other Schoolhouse Teachers Review Crew reviewed this product. To read about their experience click the image above. Hey Buddy!, I found this information for you: "Apologia Astronomy Review". 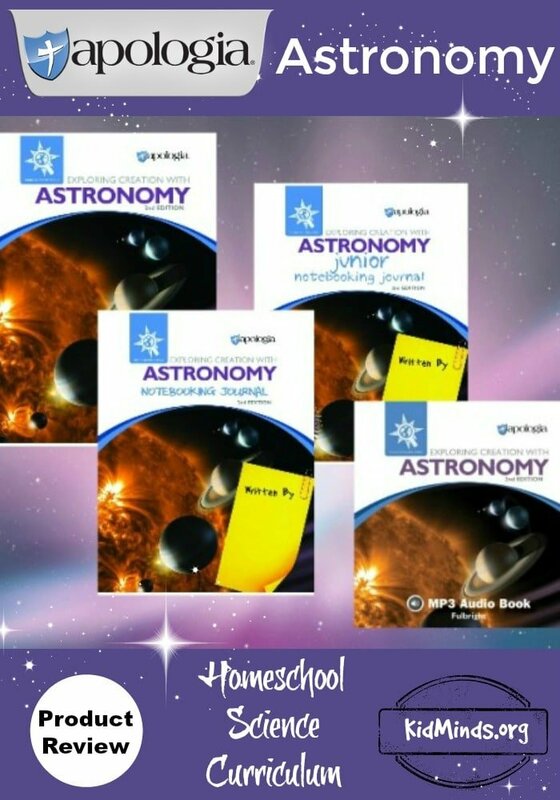 Here is the website link: http://kidminds.org/apologia-astronomy-review/. Thank you.